It was a blast hiking to this waterfall and walking behind it, hearing the roar of the water. 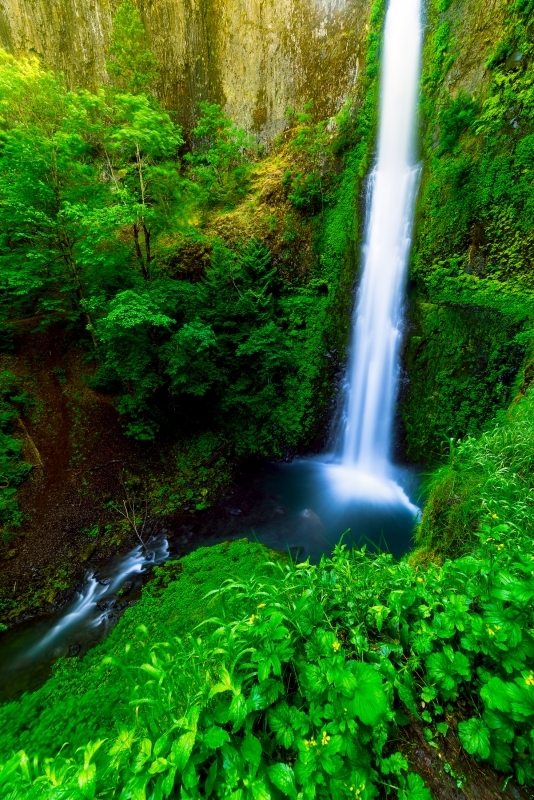 Tunnel Falls is the destination of choice for hikers traveling the famous Eagle Creek Trail near Portland Oregon. The falls, arguably the best along the trail, plunge a sheer 165 feet into a bowl sculpted out of a protrusion of columnar basalt. Of course the real thrill of this waterfall is walking through the namesake tunnel, which was blasted out of the cliff behind the falls so that the trail could circumnavigate the stream without an expensive bridge. There's really nothing like walking behind a waterfall, but not really, then emerging from the dark passage and literally being able to reach out and touch the falling water. Of course such a distinctive feature isn't without its hazards. As the trail passes behind the falls there is no hand rail to protect one from falling 60 feet to the rocks below, just a narrow cable bolted to the cliff on the other side of the trail.